Wednesday, September 28, 2011 By Niko Leka & Pip Hinman from www.greenleft.org….au. 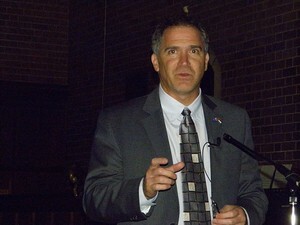 Israeli activist and author Miko Peled (pictured), currently touring Australia, is convinced that the Israel-Palestine conflict can be solved. But, he told public meetings in Sydney and Newcastle, he doesn’t believe that it will happen while the government of Israel remains committed to Zionism (the maintenance of Israel as an exclusively “Jewish” state) and continues its ethnic cleansing operation by moving Palestinians off their land. To continuing reading the article from www.greenleft.org….au click here. For more information on Miko Peled visit mikopeled.wordpress.com…. Filed under Israel and Palestine by Father Dave on Oct 4th, 2011.